The rivalry between Britain’s two-time Paralympic and world gold medallist Jonnie Peacock and USA’s double 2015 world champion Richard Browne is set to be renewed at the Great North CityGames on Saturday. 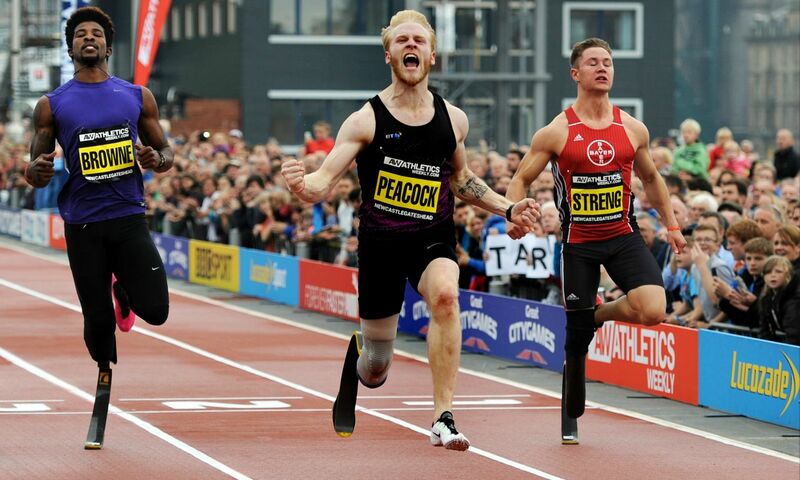 The pair had been due to clash at the Great CityGames in Manchester but the American withdrew while he also did not race at the World Para Athletics Championships in London so the street athletics meet offers the chance for a much-anticipated 100m head-to-head between the two sprinters. It will be Peacock’s last race before he appears on reality TV show Strictly Come Dancing this autumn. Following in long jumper Greg Rutherford’s footsteps, the sprinter will be switching spikes for sequins on the hit BBC One show, becoming the first para athlete to take part in the programme. Peacock and Browne will be joined by Mike Seitis of Greece, who won T44 400m world gold in London this summer, plus Ronald Hertog of Netherlands, the world long jump silver medallist, on the banks of the Tyne. With a range of events on offer from 100m to the one-mile distance plus pole vault and long jump in a specially-constructed arena on the banks of the Tyne, the Great North CityGames kicks off a weekend of first-class sporting action. It encompasses the Simplyhealth Junior and Mini Great North Run, the Simplyhealth Great North 5k and finishes with the world-famous Simplyhealth Great North Run on the Sunday.